Oil on canvas, 24 x 30 inches. 2014. Prints are available but the original is NFS. English sunrise. 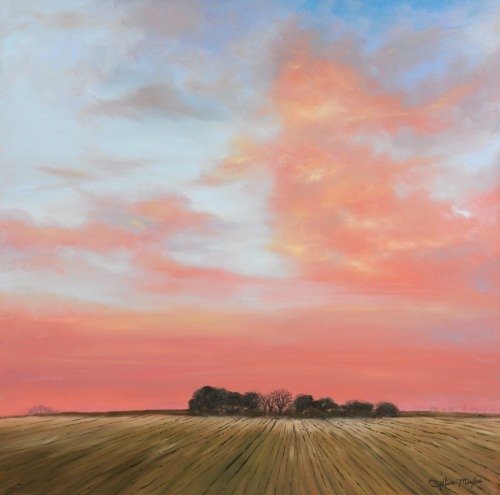 This is a view from RAF Feltwell and is owned by a private collector. 5" x 5"11" x 11"17" x 17.25"23" x 23.25"29" x 29.25"34.75" x 35"
This was a commission piece. The person commissioning it grew up in this town in Austria but now lives in the States. This is a nice way to have a little bit of home with you wherever you go. My husband and I experienced this sunset on our honeymoon in Negril, Jamaica. It was spectacular, and I tried to capture that beauty on canvas once we were home. The original is in our personal collection. 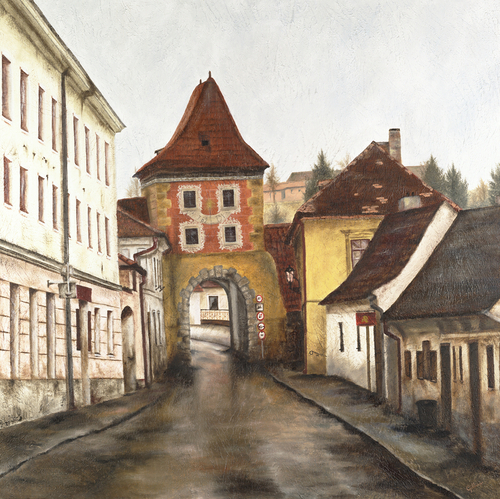 12.125" x 9"17.5" x 13"22.875" x 17"28.25" x 21"35" x 26"
Cesky Krumlov is in the southern part of the Czech Republic. While studying abroad in Prague we visited this beautiful, quaint town. It had just rained and I loved the way the street shined. This original is in our private collection. 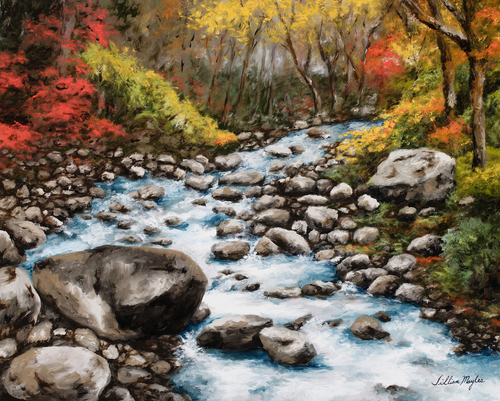 11" x 11"17" x 17"23" x 23"29" x 29"35" x 35"
There is nothing more peaceful and relaxing than a mountain creek, especially in the Coloradoan fall. The original is in our private collection. 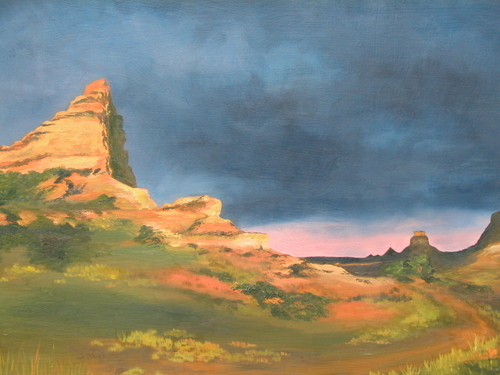 9" x 11.25"14.375" x 18"
While studying at the University of Colorado at Boulder, I painted this in one of my first painting classes. The original is in my private collection. 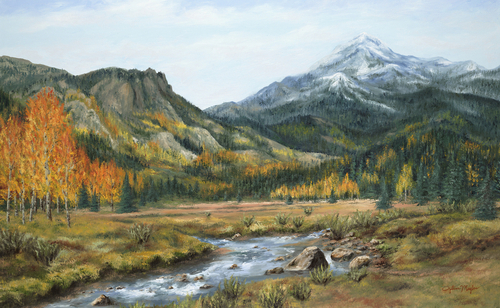 9" x 12"13" x 17.375"17" x 22.75"21" x 28.125"26.125" x 35"
This painting encompasses the beauty of Colorado. From Rocky Mountain National Park to Grand Lake, the gorgeous colors of fall are warm and vibrant. The original belongs to a private collector. 8" x 13"11" x 17.875"14" x 22.75"17" x 27.625"21.5" x 35"
This was a commission piece for a couple who lived in San Sabastian, Spain for a year. They had a hard time finding a painting there that fit their style, so they commissioned one from me. It turned out to be one of my favorite paintings. I was inspired after a trip to Clearwater Beach, Florida. 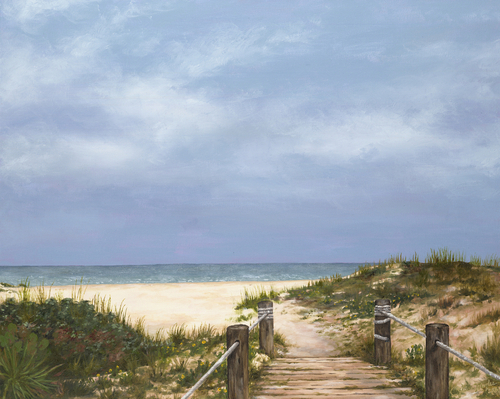 I've always loved walkways onto beaches and tried to capture it. The original is in our personal collection. 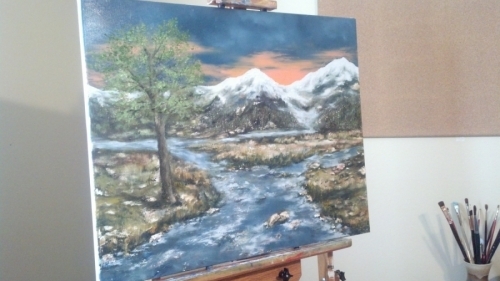 10" x 12.5"15" x 18.875"20" x 25.125"25" x 31.375"27.875" x 35"
Montana River landscape, near Big Ski ski resort. These are two seperate canvases, called a diptych. Each measuring 12 x 16 inches. 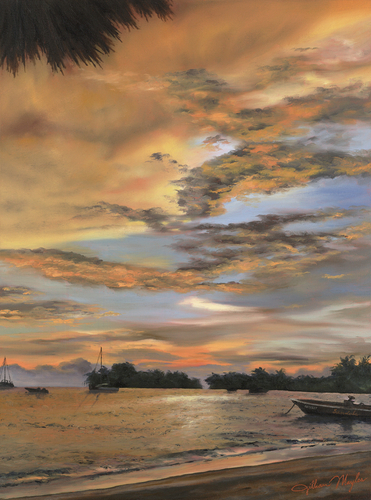 I thoroughly enjoyed mixing these colors in these paintings, the ultimate peaceful palette. 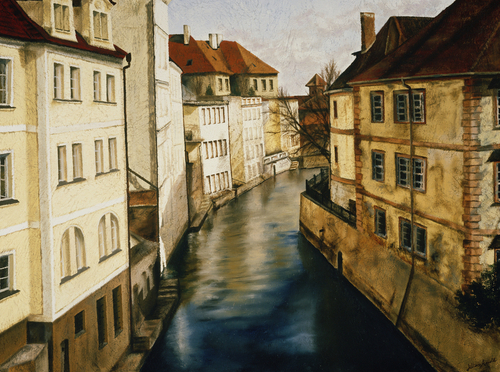 While studying abroad in the Czech Republic I took many photographs that I later referenced in paintings. This is near the Charles Bridge in Prague. The original belongs to a private collector. 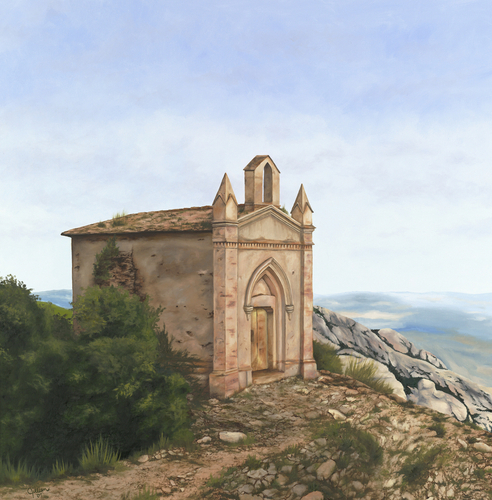 9" x 12.125"13" x 17.5"17" x 22.875"21" x 28.25"26" x 35"
This chapel is within the Montserrat Monastery outside of Barcelona, Spain. It was a gorgeous view and one that I wanted to paint once I got home. 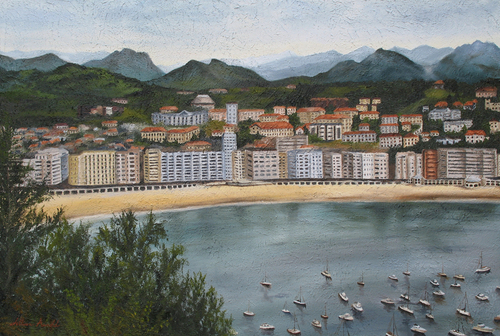 I painted this for my parents as a thank you for taking me to Barcelona as well as all they did for my wedding. 10.125" x 10"15.25" x 15"20.375" x 20"25.375" x 25"32.5" x 32"
I am currently working on a large commission for the Navigators based in Colorado Springs. 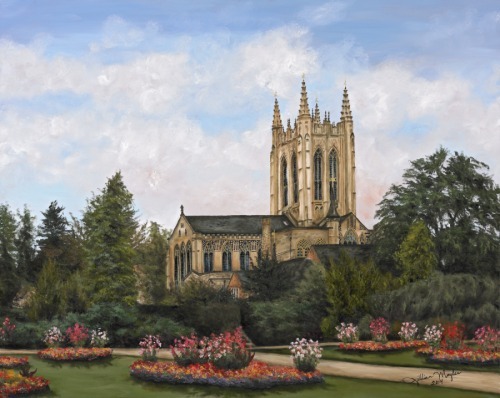 I have been commissioned to do four castle paintings, one for each season. As well as four portraits of their founders. 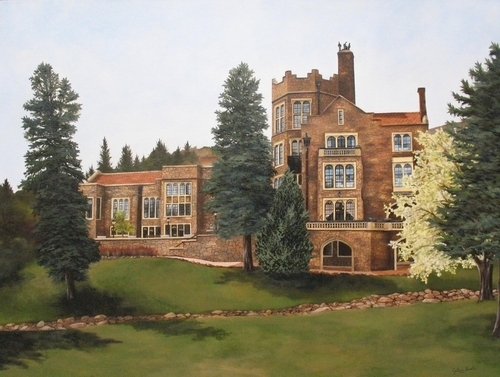 This is the castle painting that I finished for spring. The original is hanging in their corporate office. This was a commission piece and I love the way it turned out. The colors are softer yet my attention gravitates to it. The original belongs to a private collector. 11" x 11"17" x 17"23" x 23.125"29" x 29.125"34.875" x 35"
My husband's grandfather built this birdhouse, which was one of his many passions. 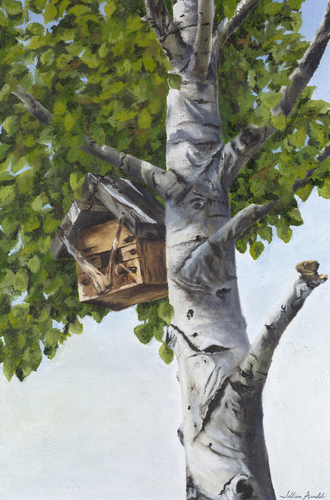 The same year he died the aspen tree also died EXCEPT for the one limb that the birdhouse was hanging from. The original is in our private collection. 13.625" x 9"19.75" x 13"25.75" x 17"31.875" x 21"35" x 23.125"
My uncle passed away a few years ago and this was the view from his house in Philip, South Dakota. 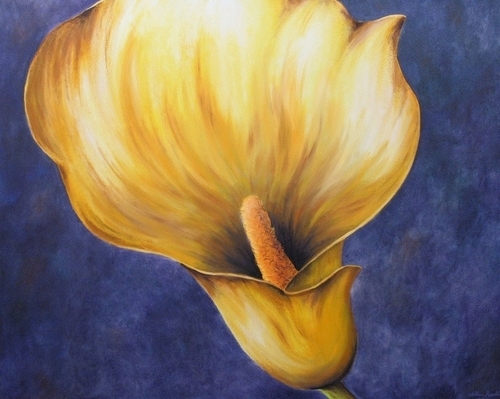 This painting now hangs in my aunt's new home, since she had to move after his passing. I'm so thankful she still gets to see this view. 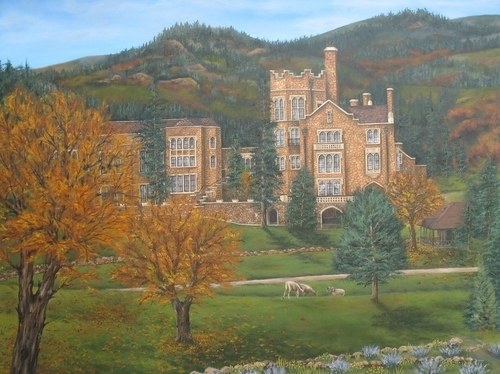 Commissioned painting for The Navigators who own Glen Eyrie Castle. It is a historic and majestic castle in Colorado Springs near Garden of the Gods. I painted this in my first painting class in college and it is when I fell in love with oils. The original belongs to a private collector. 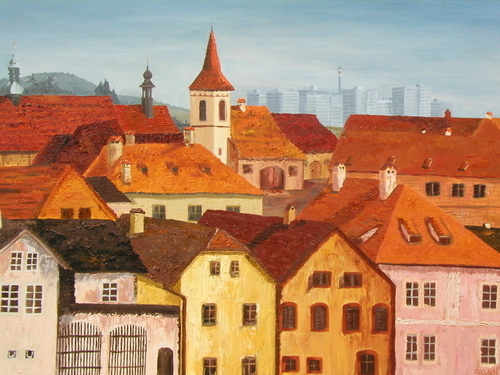 This painting vividly portrays the beautiful city of Prague with the communist flats in the background. The original belongs to a private collector. While in Barcelona we passed this adorable apartment and scooter while walking up a steep hill towards Park Guell. The original belongs to a private collector. My husband and I love to go skiing whenever we get the chance. 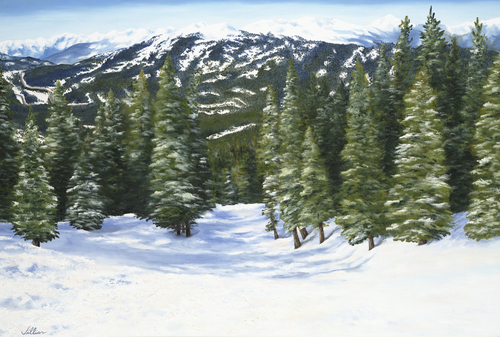 This view is from our favorite ski run at Copper Mountain in Colorado. The original is in our private collection. 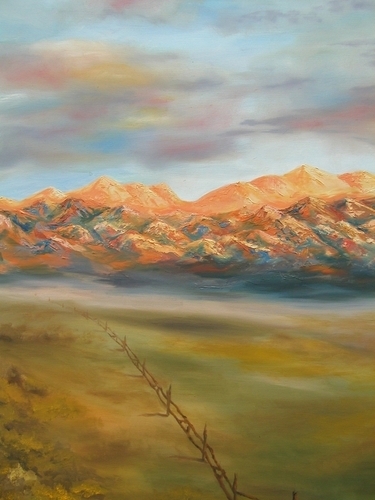 9" x 13.375"13" x 19.375"17" x 25.25"21" x 31.25"23.5" x 35"
These mountains, the Sangre de Cristos, stood out to me on a drive to Durango, Colorado. A few years later I ended up backpacking in them for a month. 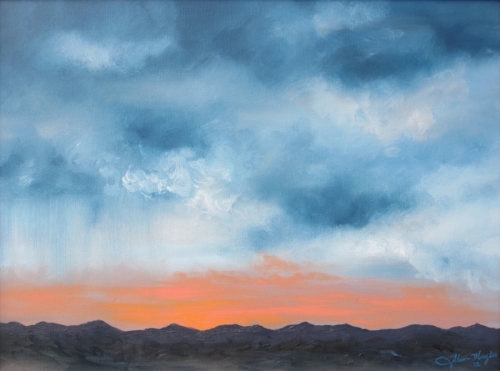 This original now belongs to a private collector. 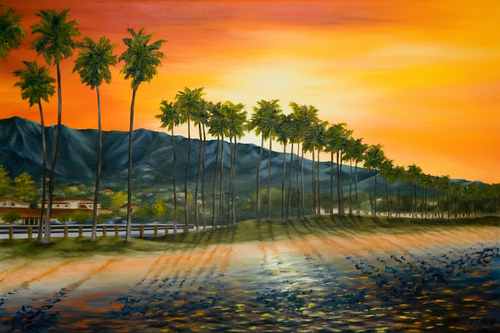 This was a commission piece done for a couple that loved Santa Barbara. They had participated in a bike ride along this road and a commission painting was a great way to remember that experience. 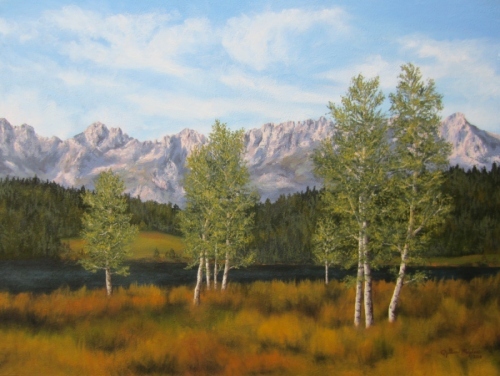 This painting won an award in the Glenwood Springs Fall Art Festival in 2007. 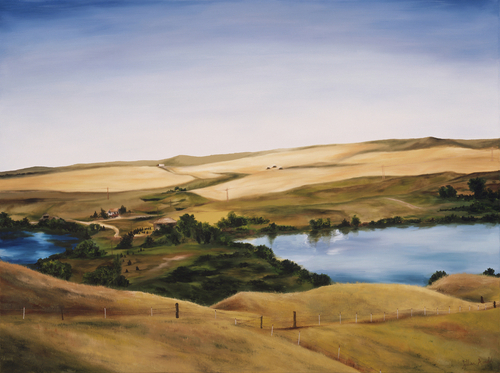 I gave it as a gift to my grandparents who live in Des Moine, IA. This painting was a fun experiment using oils on a board. I was teaching my husband and brother some techniques, so their initials are also signed at the bottom. The original belongs to a private collector. 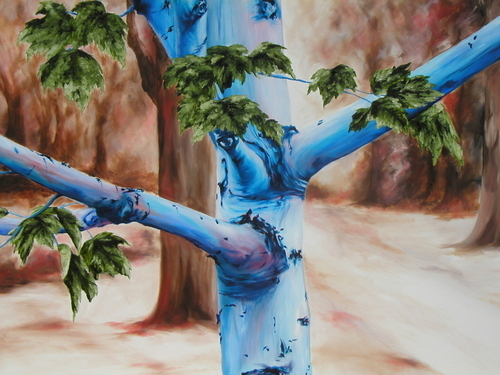 While painting this tree I was thinking of my mom to figure out what colors to use. This was a gift for her. 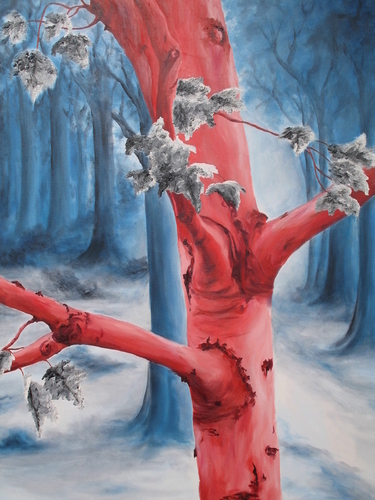 I painted this tree for my brother and sister-in-law for a wedding gift. Their initials are etched in a heart on the bottom part of tree. 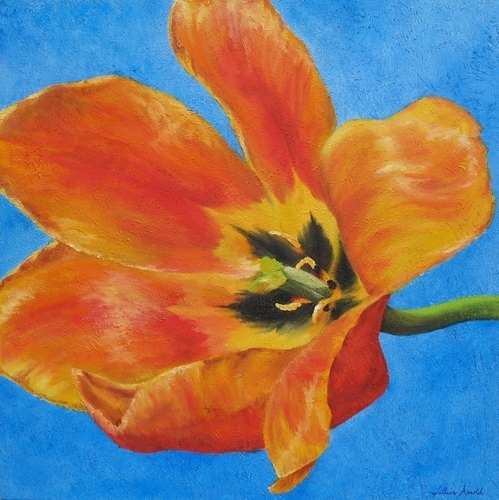 This is a very vibrant painting and would light up any room. 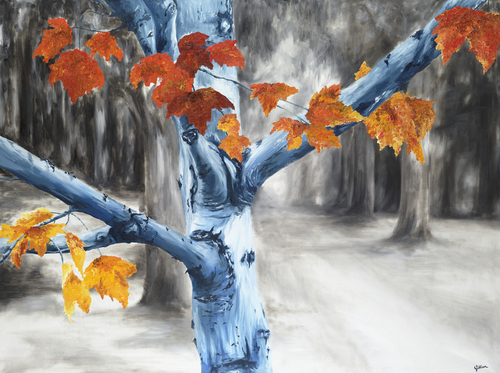 It is a fairly large piece (3x3 ft). 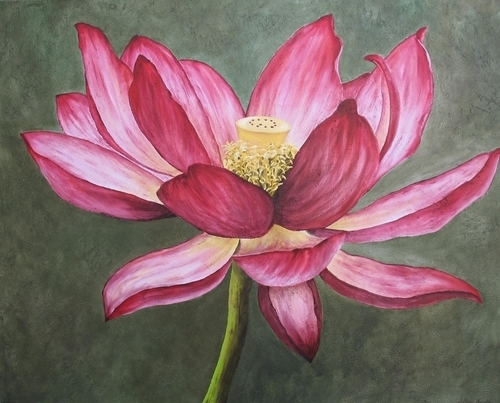 The canvas has a thick texture which gives the painting a nice depth. Please contact me if you are interested in purchasing this piece. 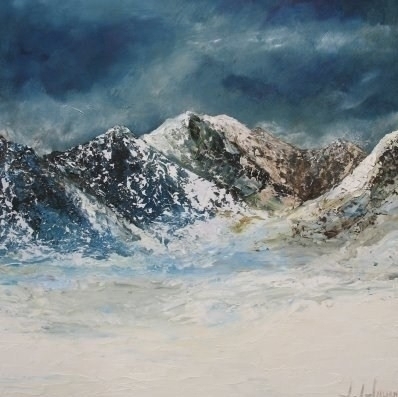 This is a very large painting (4x5 ft), perfect for a big wall space. 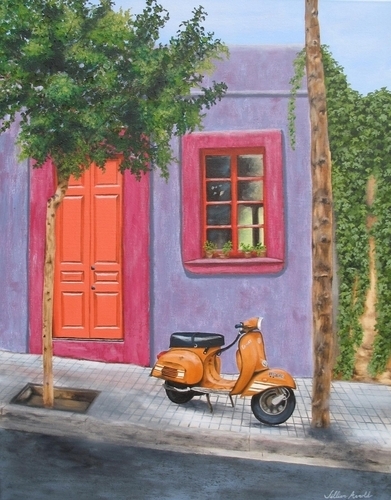 It is the first painting I experimented on texturing the background. It has a nice subtle texture. Please contact me if you are interested in purchasing this piece. This was a commission piece. I also textured the background in this painting and used complimentary colors to make the image really stand out. 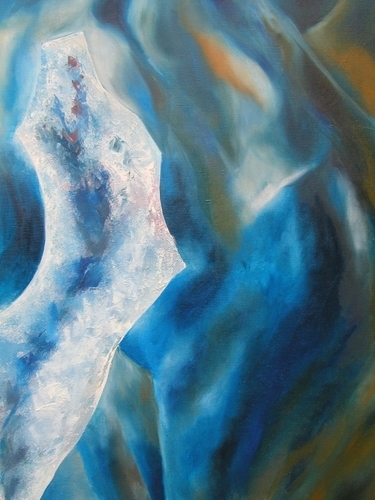 This painting looks abstract but it is really a geode. When I paint I tend to blow the images up and sometimes it ends up looking abstrast. 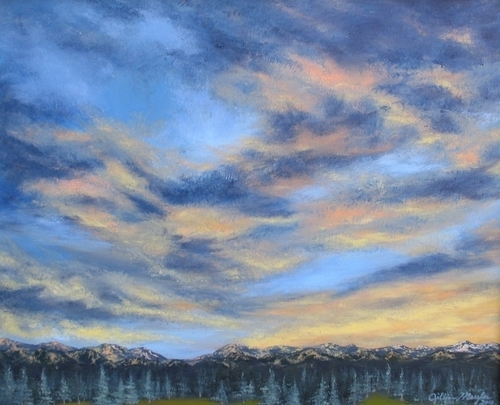 Mountain sunset painted for my brother and sister-in-law for their wedding gift. 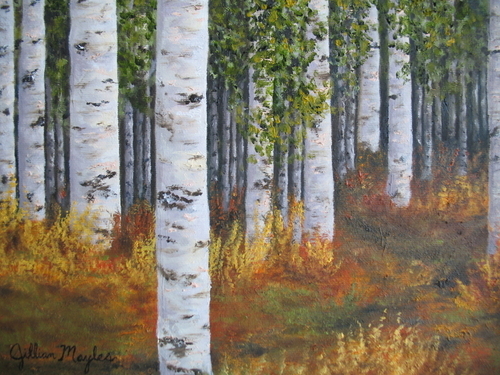 This is the very first painting signed "Jillian Mayles". I was proud to give it to my in-laws as a thank you for all they did for our wedding. 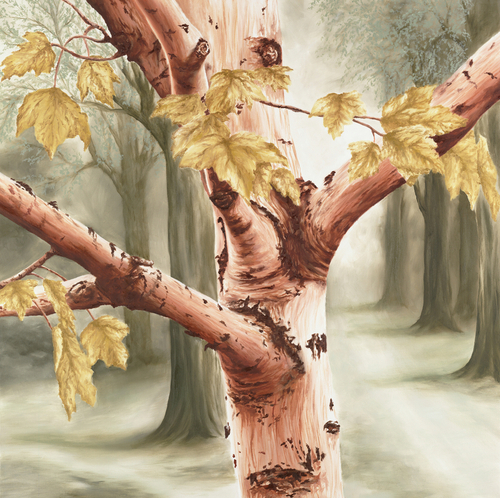 I have used this image of a tree in many of my paintings but changed the colors. I find it fascinating to see how different color combinations give different feelings to the viewers. This original is for sale, please contact me if you are interested. 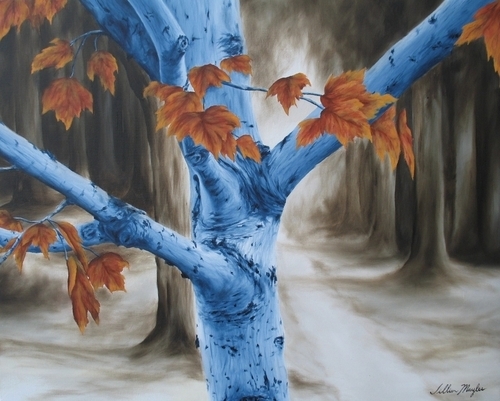 and whose leaf does not wither— whatever they do prospers." This painting now belongs to my pastor. Good ol' Colorado mountain silhouette with a sunset. This painting has sold.